Travelling seems to be either movement or waiting. Waiting at airports. The check-in queue. The security queue. The flight lounge. Waiting for the long flights to finish in order to “do” things. Then the movement. We’ve had five packed days in California visiting cousins and zipping around Napa Valley, and four days in Edmonton, Canada, staying with friends we haven’t seen for a year who are more like family. It’s been busy but lots of fun. Yesterday we flew to Victoria on Vancouver Island, and today we visited a Fall Fair, a beautiful harbour, scenic lookouts, and the best coffee I’ve had in a cafe since we left Australia – Ottavio’s if you’re interested. Back in the Oak Bay Hotel this afternoon our Canadian friends went to their room to rest and my husband went to our room to snore. 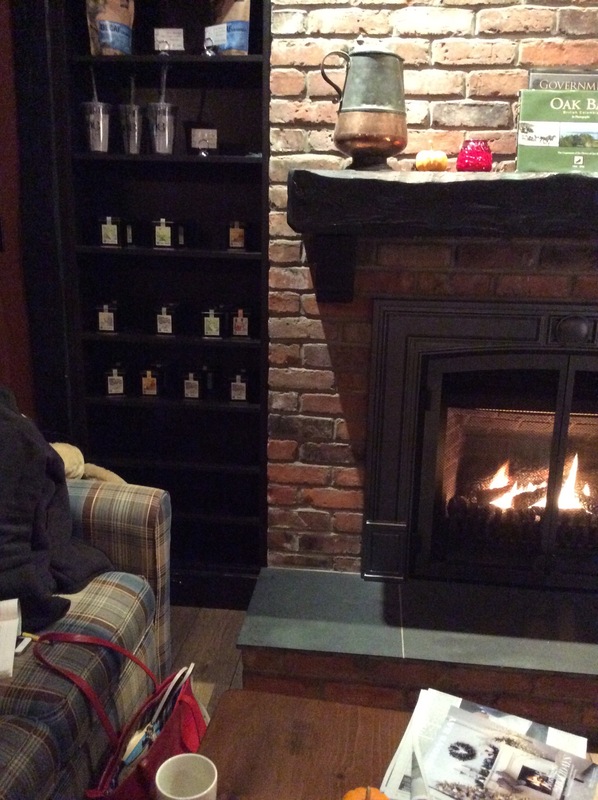 The cafe, the fire, a good book, and a quiet hour to myself seemed my most appealing option. I watched the flames flicker and my book lay unopened in my lap. There’s something stilling about fireplaces. I had nowhere to go, nothing I needed to see, no one else to please. I’d stopped moving and wasn’t waiting for anything. Outside the sun was going down inconsiderately early and the temperature hovered around zero. People hurried past the window in Michelin Man jackets, knitted hats and cheeks raw from the wind. Inside I snuggled into the checked sofa and my cheeks were flushed from the fire. I cupped a hot mug of English Breakfast, not for the warmth, but for the comfort of warmth. It occurred to me then that this one still moment contained the whole of Victoria. Not just the warm snug I’d found in front of the fire, but also the tea and the taste of that rich coffee earlier in the day, and the pleasure of being with seldom seen friends. It held the mountain we climbed and the bitter whip of the wind, the mist and the snow capped peaks across the water. It seems to suggest that true travel mightn’t be, as the word suggests, about movement. Maybe it’s in the still moments, when you step back from all the rushing and doing, that you see what’s around you more clearly. Maybe you need that stillness to give space for the separate elements to cohere into a whole picture of what a place means to you. This entry was posted in Travel and tagged Canada, moments, stillness, travel, travelling, Vancouver Island, Victoria. Bookmark the permalink. This is such an insightful and thoughtful reflection, Karen that has obviously stemmed from those warm, pensive moments of stillness in front of the fire and therefore supports your conclusions about true travel. So pleased to hear the satisfaction in your ‘blogging voice’ and hope the rest of your trip yields more ah-ha moments. Thanks, Diana. The hotel has a heated pool and hot hot spa down by the water. I’ve just come back from forcing myself to go down through the freezing late afternoon in swimmers with only a hotel robe and those white towelling slippers for warmth. Lounging in the hot spa jets with a glass of local white, enormous snow covered Mount Baker as a backdrop I think I’ve finally got the hang of this stillness thing. Karen,this is such a beautiful and mindful reflection which urged me to stop and take time out to appreciate the moment. Being mindful of our environment can be so enlightening as you have shown. It’s also good for our mental health. Thank you for sharing and reminding me to immerse myself in the here and now, you’ve given me a little ‘pick-me-up’. Hi Maree. I’m delighted you got a lift from the post. These moments are like little meditations, I think. We all need reminding to stop, even if just for a moment. Especially when we think we don’t have time for it. I would love to meet you, Dawn! I’m not sure where you are in this region. We aren’t going to Vancouver, at all. Hard to believe, I know, but we’ve had to streamline everything this trip. Tomorrow we go up to Tofino until Thursday, and then on Friday afternoon travel down to Seattle. We’re there until Sunday morning when we fly out to Boise, Idaho, to stay with dear family friends for Thanksgiving. Are you anywhere near Seattle? It would be wonderful to see you. Do you find some places lend themselves to stillness, Joanna. We’ve just had four days in Tofino on the west coast of the island. It had some of the best scenery of the trip but also a wild naturalness that made it incredibly easy to just sit and absorb it all. I do, yes. I’m not sure whether it’s the energy there, or how natural the environment is – perhaps a blend of both – but it’s definitely easier some places than others. Cornwall is one of my favourites – rugged coastline, waves travelling across the Atlantic, and quiet little villages if you can find them! Lovely writing Karen! I’m envious too. Vancouver Island is one of the settings in my novel Crossing Paths but I haven’t been there yet! Thanks for dropping by, Debbie. We loved Vancouver Island. Tofino on the west coast is a beautiful spot. Where on Vancouver Island did you set the novel?